by Anoosheh Oskouian, CEO, Ship & Shore Environmental, Inc.
Consumer and industrial market applications are constantly challenging paint finishing for fastener manufacturing operations with coating specifications that provide high quality durable finishes to meet customer expectations. The finishing industry is also challenged to deliver these finishes in an environmentally friendly fashion to minimize impacts to local surroundings and the air we breathe. Emissions from the paint, coating and fastener finishing process emit Volatile Organic Compounds. VOCs (evaporated solvent based materials) are regulated by Federal, State, and local regulatory authorities by guidelines established through the New Clean Air Act passed in 1990 and modified throughout the years. In general, these regulations limit the amount of VOCs or solvent emissions that can be emitted by a coating operation as a single solvent or as a solvent mixture. These are generally quantified in tons of emissions (allowable) and can differ across industries and locations. There are various coating technologies that utilize solvent, water, and powder based materials, but solvent based paint coatings/operations are traditionally targeted for VOC abatement. However, keep in mind water based materials do contain small amounts of solvent. High usage operations could eclipse threshold limits established by law and thus trigger the need for VOC control equipment. 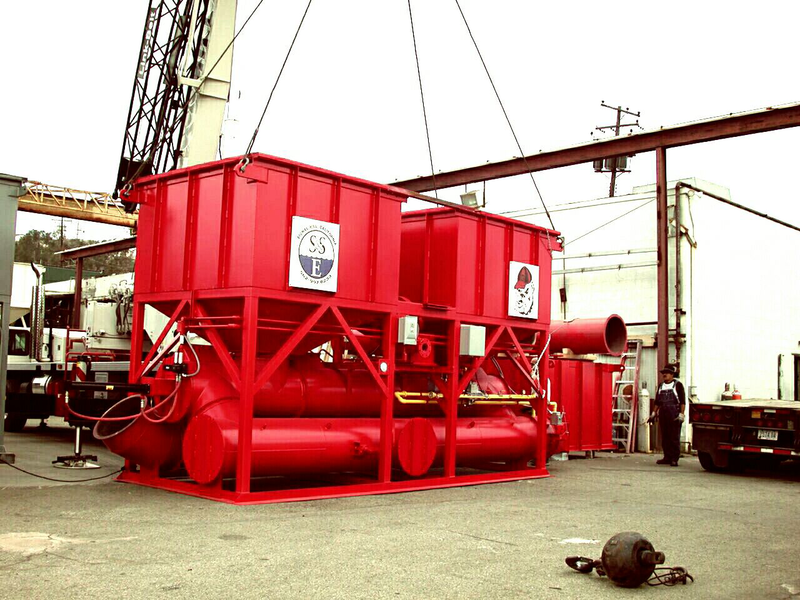 Ship & Shore Environmental, Inc. is a leading VOC equipment supplier. The goal of any well-designed air pollution control system is to minimize the impact of coating emissions from the manufacturing process in a cost-effective way to meet regulatory requirements. Solvent emissions are emitted to atmosphere in a variety of ways from painting/coating processes. At the paint application site – Spray booth exhaust. In quiet (low air movement) flash off areas. Curing or bake oven exhaust (majority of emissions found here). Our goal is to select the best control technology that provides top value, while maximizing the overall destruction efficiency of equipment. There are a variety of technologies – Thermal Oxidizers (most prevalent) that can be used, but in general the end result is combusting (oxidizing) the VOC compounds at a temperature of approx. 1450 to 1500 degrees F and converting the compounds to primarily carbon dioxide and water vapor. In general, all of the technologies perform well to meet most regulatory requirements. But, from this point, there are different qualities that make or break the use of the technology. A Direct Fired Thermal Oxidizer (TO) can achieve very high destruction efficiency +99% at very low cost to install. However, TO’s can be quite expensive to operate unless there is a tremendous amount of solvent in the exhaust stream that is being treated. The BTU value from the solvent load can supplement the burner operation reducing the amount of natural gas utilized, but in general this is a very expensive technology to operate. Catalytic Oxidizer Technology (CATOX) can achieve generally up to 98% destruction efficiency. CATOX technology uses heat and catalyst technology (precious metal) to destroy VOCs at a lower operating temperature (700 to 800 degrees F) for minimum energy usage. However, catalysts can be prone to contamination – poisoned, sintered, coated that would adversely affect performance depending on the process. Catalysts are expensive to replace (possibly every 3 years based on production) and only recover up to 60% of energy in the combustion process thru an integrated heat exchanger unit. Cost is considered high to install. Recuperative Thermal Oxidizer (RECUP) similar to TO’s. These can achieve +99% destruction efficiency. RECUP’s can only recover up to 60% energy expended in the operation of the unit via an integrated heat exchanger within the unit. Cost is considered lower to install. Based on solvent concentration available in the exhaust stream, operation can be expensive. 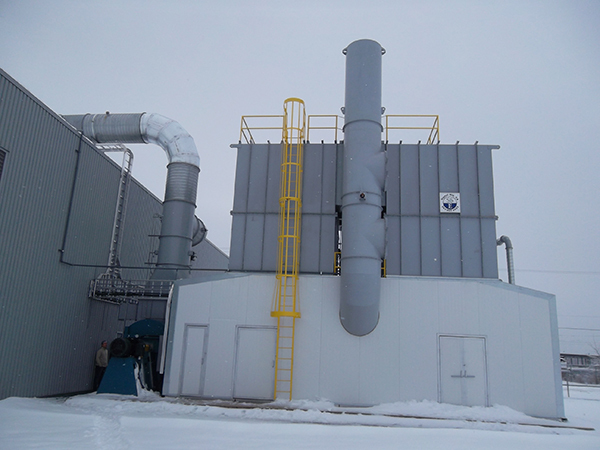 Regenerative Thermal Oxidizer (RTO) features destruction efficiency to 99% and thermal efficiency to 97%. RTOs tend to exhibit the most flexibility in a variety of applications due to their excellent destruction and thermal efficiency properties. RTOs tend to be popular because they can effectively control very low solvent concentrations cost effectively, due to built-in heat recovery (most efficient technology), and, in turn, have high destruction capabilities. The downside to RTO technology is that it tends to be the most expensive to install. But, these capital costs can be offset over a shorter period of time with lower operating costs (lowest natural gas consumption). Ship & Shore Environmental, Inc. is an engineering design and fabrication company that demonstrates the ability to best match oxidizer technology to a specific application. The key to a successful air pollution abatement equipment implementation project starts with a review of relevant parameters by experienced engineers with expertise in the type of manufacturing process requiring the abatement system, and the ability of the supplier to understand the unique goals and objectives of the application. 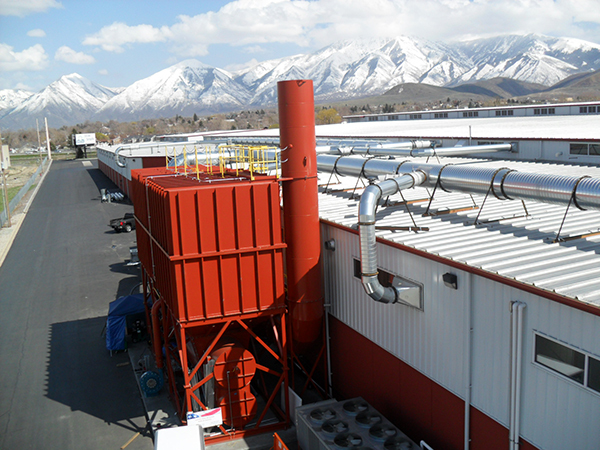 The decision to control VOC emissions with a thermal oxidizers from your manufacturing process, whether mandated by regulation or voluntarily, comes with a price. These are usually manifested in dollars and time across your organization – Manpower, new equipment, added energy costs, regulatory permitting challenges, and Facility design changes (concrete, ductwork, piping and wiring). For maximum project value throughout the entire equipment selection process, several basic value added benefits should not be overlooked for best project value. – Minimizing air flow to the oxidizer while enhancing VOC capture (using air emissions as fuel) to the abatement unit. – Working with environmental engineers and/ or consultants to achieve regulatory compliance. Assistance in filing for air quality permits. – Researching possible secondary process heat recovery opportunities to maximize energy recovery for overall lower operating costs. – Incorporating design provisions in the system anticipating future potential process changes. – Knowledge, experience, and relationships to take advantage of new construction incentive rebates available through natural gas and electric utility entities. These very lucrative returns are available primarily for highly energy-efficient equipment projects such as an RTO. There are possible 6 figure rebates based on equipment sizing. Ship & Shore’s experienced personnel are hands on, and understand the core principles of manufacturing processes. Alongside with plant personnel, Ship &Shore Environmental baselines, designs, and integrates environmental control technology for more lean and feasible operation. Operation of a VOC control system is energy and capital intensive but there are factors that offset these costs. VOC sources from within the plant can be handled in a way that minimizes total flow by adding permanent total enclosures (PTEs), and or, recirculating a portion of the source stream back to the process. In this manner, incoming fresh air can be conditioned (in the case of dryer/oven exhaust, preheat incoming air saving initial dryer energy cost) and the amount of air that flows to the destruction device can be reduced (lower capital cost for smaller equipment). In addition, by recirculating solvent-laden air back to the process, VOCs or Btu value in the overall exhaust stream is increased, providing fuel to the destruction device (solvent air combusts in the thermal oxidizer, minimizing fuel needed for the oxidizer to maintain temperature). In certain instances, this recirculated air stream can provide enough fuel value for the pollution control device to operate without any primary natural gas or in pilot mode. By reducing total air flow, the VOC control device can be downsized resulting in lower capital cost. This can be accomplished by design of capture hoods, floor sweeps, enclosures, ducting, and recirculation within the process generating emissions; resulting in a significant reduction in overall air flow requiring treatment and an increase in the overall solvent capture levels. Safe solvent levels within the process operation must always be considered and may require LEL monitoring. Additional benefits of a properly designed solvent capture system include: reduction of fugitive emissions, increased total VOC capture, increased total VOC destruction for the facility, reduced natural gas usage for the control device, and reduced overall operating costs. “Tail Pipe” energy recovery is also possible. VOC control devices operate at very high temperatures (1500 degrees F typically). Although certain oxidizers can recover up to 97% of this heat (in the case of an RTO), there is enough remaining heat in the exhaust temperature to provide heat for secondary air/water sources needed within the plant or process. Secondary heat exchangers can provide fast payback to offset additional project costs. Additionally, many of these concepts qualify for utility provider incentive funding dollars. In matching painting process applications to VOC control equipment options, strict quality control fabrication measures ensure systems meet demanding needs. 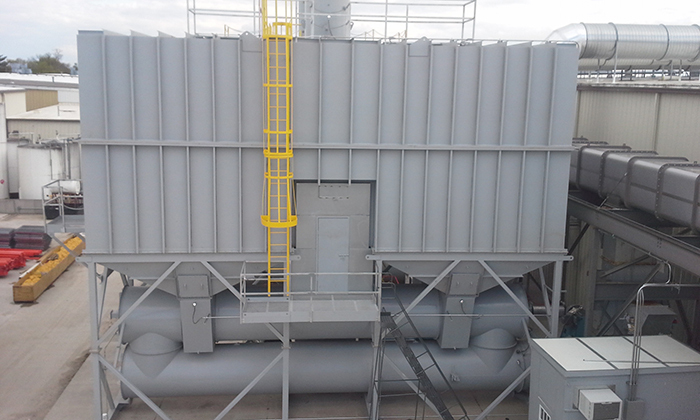 Oxidizer systems must be reliable, durable, easy to maintain and operate. PLC controlled with touch screen HMI interface are all hallmarks of oxidizers designed by Ship& Shore Environmental, Inc. In all of these ways, Ship & Shore provides tailor-made solutions, helping place each customer in a position of success by focusing on cost-effective solutions that provide long-term success and compliance with regulations. Better air quality, energy efficiency, maximum profitability, and return on investment, all allow companies to grow and expand their businesses through the addition of well thought out environmental controls.